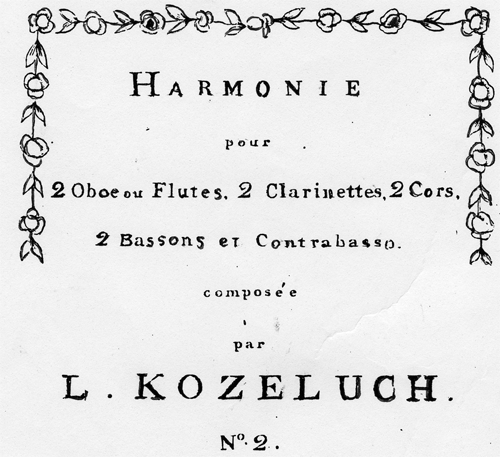 Leopold Kozeluch (Kotzeluch, Koželuh) was born in 1747 in Velvary, a small town 25 km northwest of Prague. He was the son of a shoemaker and cousin to the composer Jan Antonn Koželuh (1738–1814). He was originally baptised with the name Jan Antonín but changed it to Leopold to avoid confusion with his cousin. He studied law at the same time as his musical education but soon abandoned this in favour of a full time career as a musician. He was taught by his cousin and the composer Frantisek Xaver Dušek (1731–1899). His musical career flourished and was so well thought of in Vienna (as a pianist as well as a composer) that he was offered the post as court organist to succeed Mozart—an offer that he refused; although he did accept the position of court composer in Prague that Mozart's death left vacant. 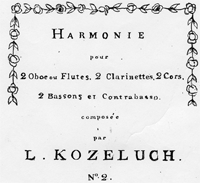 As well as life as a performer, Kozeluch became a music publisher which he managed with his brother Antonn Tomáš Kozeluch, maintaining contacts throughout Europe including English publishers. After a very prolific musical life he died a few weeks before his 71st birthday in 1818. His musical output was, in general, confined to secular works, including 50 piano concerti and 30 symphonies. His works for Harmonie seem confined to a set of 8 Partitas listed by Grove as octets (2 flutes/oboes, 2 clarinets, 2 horns and 2 bassoons). This edition is based on one which includes a double-bass. It is not clear whether this is a later edition by another editor.